Of course, to enter Devon from Cornwall, one crosses the Tamar. After a short mile on paths, there’s an awful lot of road bashing to follow, but there’s some enchanting countryside, especially in the vicinity of the River Wolf and through Stowford village. My July jaunt ended at the bus stop in Lewdown village. I returned the following month, thanks to a family holiday in the region. I was allowed out first for the half-day walk to Bridestowe, notable for the Dartmoor outlier of Galton Down and the remarkable Iron Age/Norman earthworks of Burley Camp. The moor is coming closer all the while – not a good day to be on it, for the tops and flanks were mired in cloud. No pictures of my route alas other than Bridestowe churchyard, as the camera (in those pre-mobile days) had been borrowed by another. I was allowed a whole day out. The Two Castles Trail leads through Sourton and on to Dartmoor below Sourton Tors, but never takes the highest ground, so I left to drop down to the head of Meldon Reservoir, from there eschewing tracks to head above Black Tor and towards the high point of the moor, indeed southern England, High Willhays. On a grey day with a stiff breeze like today, it’s not a distinguished summit on which to linger; there is better shelter a kilometre north on the barely lower Yes Tor. The Army claims much of northern Dartmoor, as is well known (though they take August off), and east of Yes Tor they mark their presence by many land-rover tracks. Less challenge perhaps but faster walking to my agreed 4pm rendezvous, and there’s an interesting ford above East Oakment Farm. 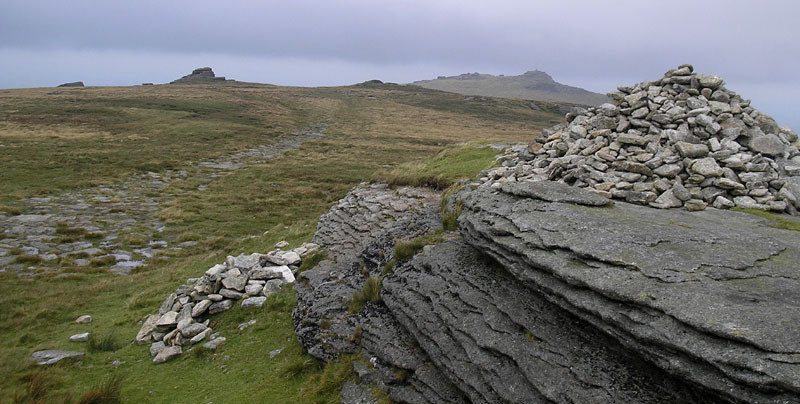 Beyond is the still-wild catchment of the East Oakment River, but my aim was Belstone Tor . From the tor I dropped down to Belstone village, joining another trail, the Tarka Trail. Its way to Sticklepath, where Barbara would be waiting, was through the inviting Belstone Cleave, but annoyingly I lost some time by initially missing the left turn into it and heading instead for the open moor. The Tarka Trail comes in to Sticklepath through the garden of the water-powered Finch Foundry, now preserved. 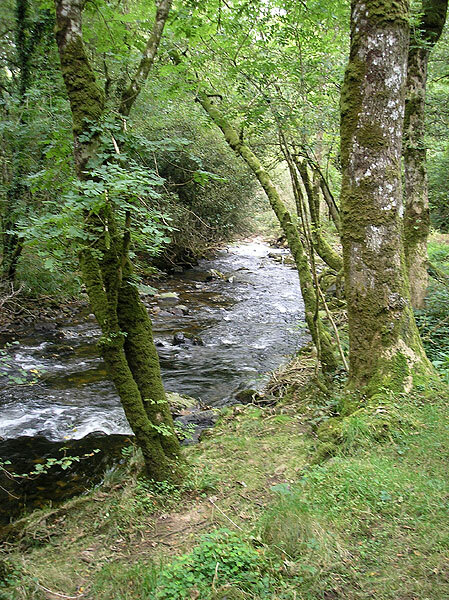 There’s a big part of Devon, away from the north and south coasts and Dartmoor, where few walkers go. I wanted to try out this section in my 2009 walk. Very rewarding it is too, especially on the little ridges leading away from Morchard Bishop, and in the Blackdown Hills. The only bit that’s really ho-hum is between the Exe and Culm valleys, where the major transportation routes to the west country run. The four pubs I sampled, all but one far from tourist hot-spots, were all doing well, yet very varied: they show how rural enterprise can flourish with the right vision. Via Spreyton. Why via Spreyton? 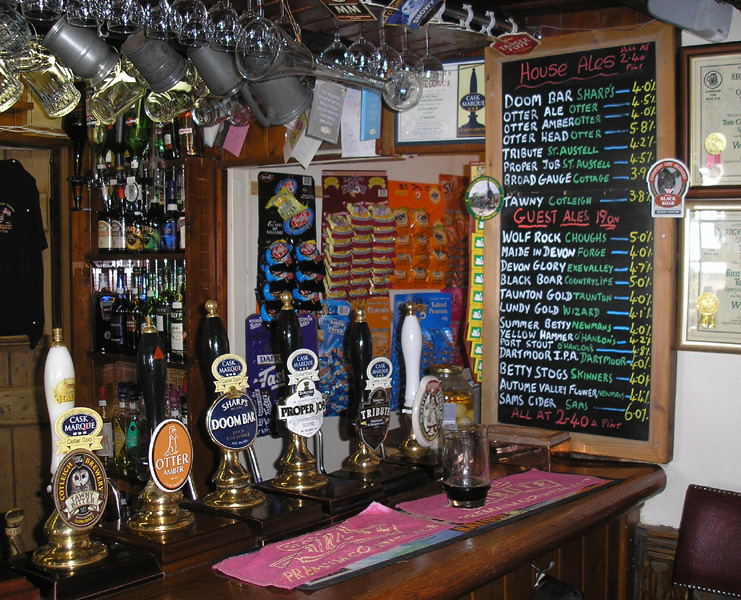 It hosts the Tom Cobley Tavern, one of the finest real ale pubs in England, today serving a choice of 19 varied beers, albeit with an apology from the landlord that the usual 25 were not on offer. It’s a bonus that it’s reached from Sticklepath by a fine green lane to South Tawton and very pretty field paths above Powlesland. 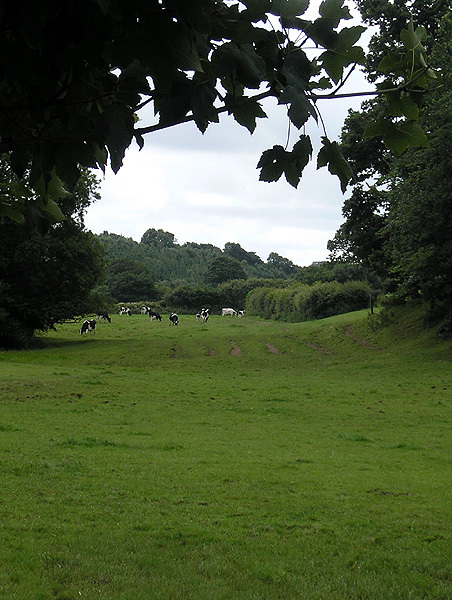 The drawback of being in Spreyton is the lack of footpaths northwards, in the catchment area of the Yeo, until the last mile from the day’s endpoint of Zeal Monachorum (= ‘cell of the monks’). 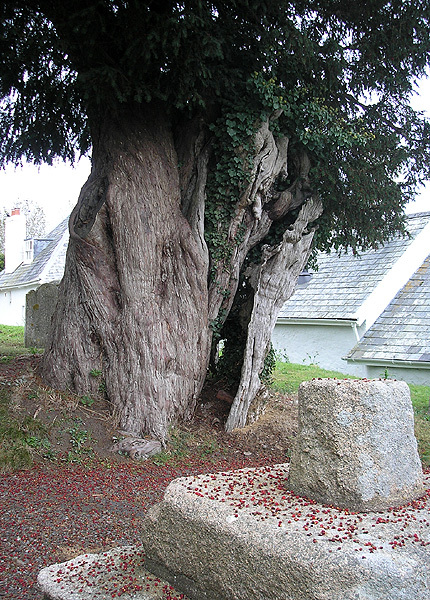 In the churchyard at the top of the village, I was struck by the evident antiquity of the still-flourishing yew tree, and inside the church a certificate proudly attests to its 1,200 years; an unimagineable, and humbling, span of life. A big day this one, with well over 2,000ft of ascent across little river valleys as well as a decent mileage. 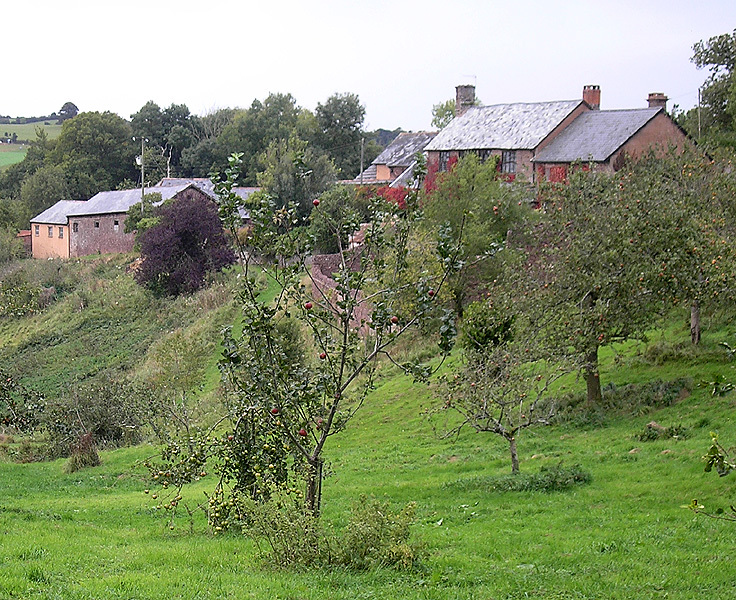 The approach to the largest village en route, Morchard Bishop, coincides with the well-signposted Two Moors Way. I switched off my navigational common-sense button here and missed a key left turn, thinking ‘what a lovely little path’ through young oak without thought to where the waymarks had gone. Ten minutes of wrong route, ten minutes of re-orientation, ten minutes back: that’s how the time can take you. And I had earlier tripped on unseen wire by a cattle grid, requiring a bit of surgery outside Morchard’s shop. 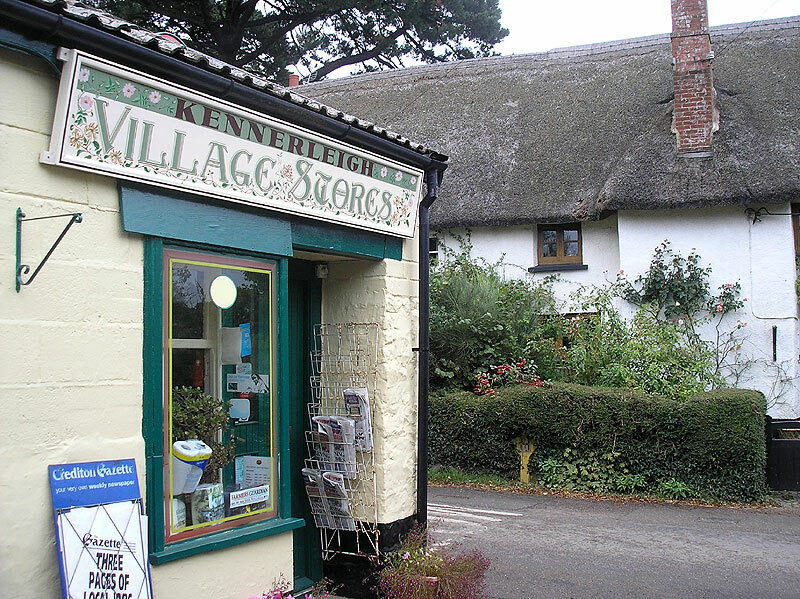 Later, tracking away from the road at the pretty village of Kennerleigh, I took a reassurance bearing – several times, until I convinced myself that my compass had flipped, that is south had become north. There is much delicious countryside around here. You continually descend into and ascend from little river valleys, none of the ascents more than about 200 feet, but each taking you from darkness to light, with the ridge-tops permitting good views of the indented valley-systems hereabouts. Intermittent drizzle turned to rain as the day progressed, until the final, most lengthy descent below the cleverly-named hamlet of Ridge. This descent led to a valley section (though with a surprising couple of rises) beside one of Devon’s two rivers Dart, in improving weather with glimpses of the sun. A much easier day, but with the highlights reserved for two river walks at start and end. First, alongside the Exe, surprisingly rough from time to time despite being the waymarked Exe Valley Way. 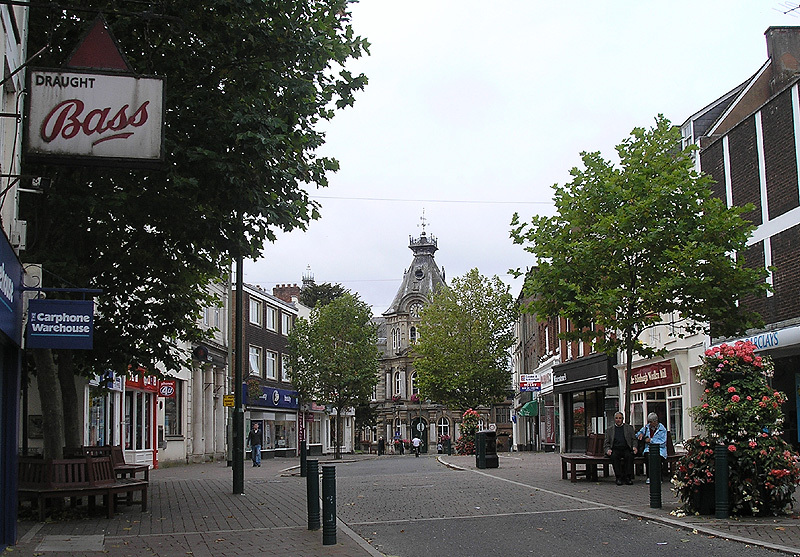 The schedule gave me the opportunity for a brief look around Tiverton, which seemed to be in reasonable nick – not too many failed shops, or charity shops, despite a massive Tescos just outside the town centre. I left the town by a national cycle path, first along the old railway, then joining the Grand Western Canal, cutting off a canal dog-leg through the village of Halberton before taking the canal again. It’s possible to stay on the canal, and later the River Tone, all the way to Taunton, and many heads-down John o’Groats walkers do so, but I branched off at Sampford Peverell as I wanted to follow the River Culm into the Blackdown Hills. The Culm and its catchment provide the gap taken by the main rail line and motorway to the south-west; unnervingly, the former is crossed on the ballast with no concessions to pedestrians. A road stretch takes you to Uffculme, a workaday place in which, with rain coming down, I was in no mood to loiter. 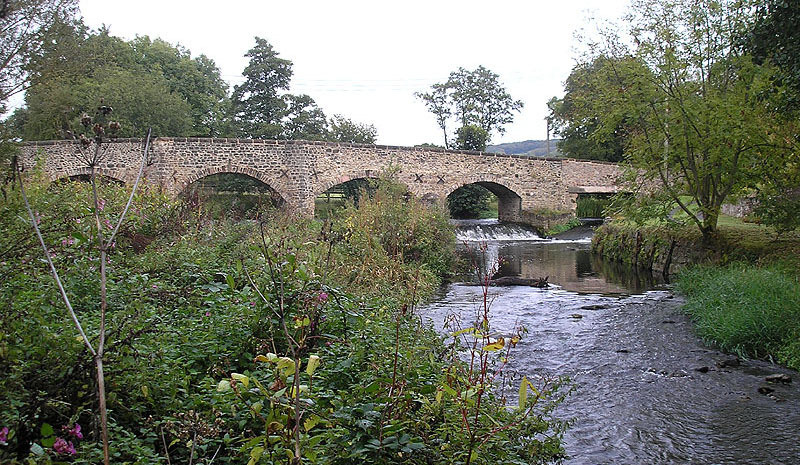 But the river is always nearby on the way to Culmstock, and indeed these two-and-a-bit miles form the pleasantest river walk so far, especially in the vicinity of Hunkin Wood. 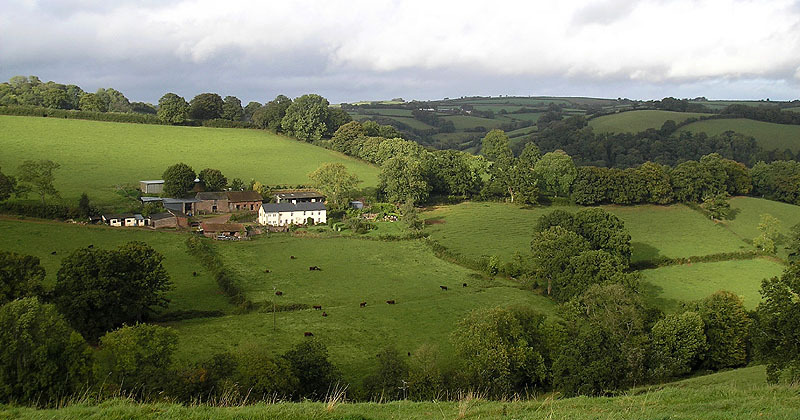 The rain had the decency to stop, and I slowed my pace down to enjoy the scenery, still with time to explore the village before settling in at the utterly remarkable Culm Valley Inn (see below). There’s a good ridge running along the northern edge of the Blackdown Hills but unfortunately a good fast road runs along it too. So instead, my plan for today was to make a brief initial visit to the ridge before heading in and out of some of the Culm’s side-valleys. I looked forward to the wide range of interesting views this would give me. I woke however to steady drizzle and cloud hanging over the 800-foot tops. This made its own drama as I climbed the bridleway to Black Down Common. 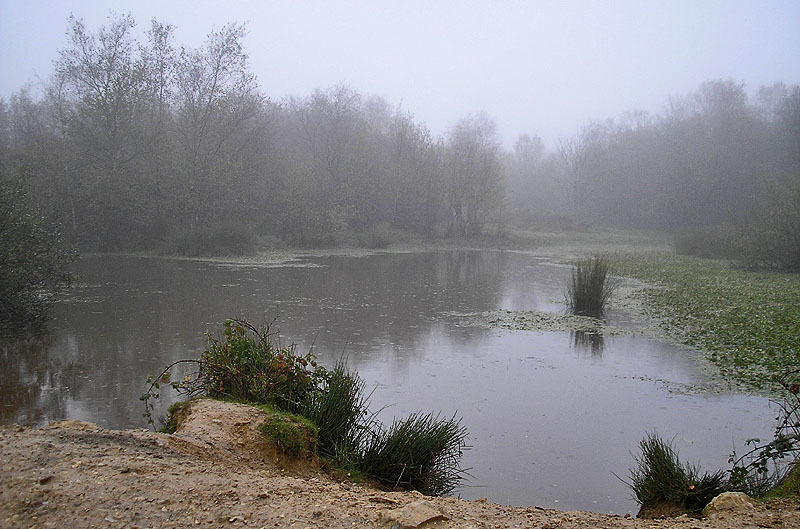 The rain strengthened across the heathland plateau and visibility dropped to 200 metres. 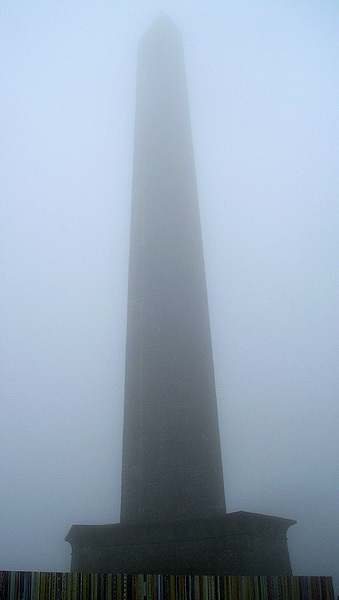 Indeed, from the base of the Wellington monument (a brief diversion into Somerset), I could barely make out its 175-foot top. Thankfully conditions soon eased somewhat as I headed back towards the Culm. 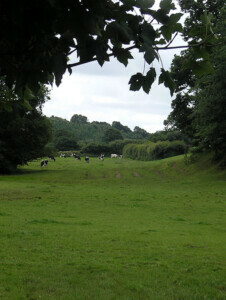 Alas, a bridleway closure at Simonsburrow forced a diversion via Ashculme. As two days before, the re-ascents from the side valleys were only around 200 foot each, but I noticed the western, ascent sides were noticeably boggier and marshier than the eastern, making slow going at times but lending an air of exploration to the affair. Below Applehayes, at a little fishing lake and hut, I crossed into Somerset. 2008: Before the stage to Lewdown, I had stayed at the Countryman Hotel in Camelford, a popular walkers’ hotel. In August, we self-catered at The Granary, Hopworthy Moor, near Holsworthy – a nice little cottage off the beaten track. 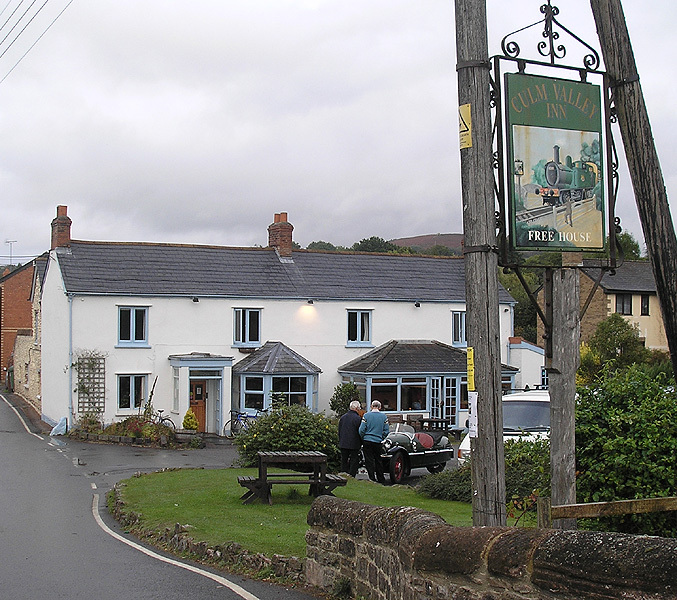 2009: the Waie Inn (not a made-up name, Waie is the bottom bit of Zeal) was a rural leisure centre as much as it is a pub, with skittle alleys, squash courts, and swimming pool among its attractions, not to mention soft- and adventure-play areas for kiddies. 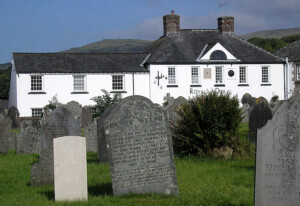 In Bickleigh, the Trout Inn was more traditional, catering for tourists and locals alike – it would have been nice though for the shower reliably to have delivered hot water at the end of a long day. The Culm Valley Inn merits a couple of paragraphs all of its own. There are those who might carp. No tea-making facilities in the room, no en suite, not even a sink, room shared with cleaner’s requisites, breakfast delayed until time of latest arrival. But they should look beyond the home comforts. This was an utterly traditional pub that also caters for guests. No cunning gastroisation here, and all the better for it – though it held ‘Devon dining pub of the year’ for those seeking sheer food quality. This being Sunday evening and chef’s night off, landlord Richard apologised but promised to do ‘something’ about it. I expected reheated roast; well, not quite. For me and him and the other two guests (a Morgan-driving couple on the way back home to Cornwall), he ordered in a Chinese, which we eat en famille in a side room. Midway, a dozen sea-bass arrived from Lyme Regis complete with fisherman; we were taken to the kitchen to admire. Dinner led on to wide discussions about the world, and a late-night game of spoof. Heard of it? Me neither. It’s a guessing game. I won, a glass of whisky, though I’m not entirely sure the prize wasn’t originally pitched as the pub itself. If I had have won the pub, I wouldn’t have changed a thing. Well, maybe bought a mug for tea in the room. Certainly not his cocktail barman (B&B = benedictine and brandy), certainly not the beer list, nor the clientele – three or four mixed age and gender groups sitting loosely around, chatting – and certainly not the genius (original meaning) of the man who runs the place. Well done, Richard.